Mass Swap for Snake Drafts and Blind Auctions is here! Swap a player across multiple contests in one quick and easy flow. I have been playing fantasy football since 2006 and am an avid player in redraft leagues and dynasty leagues, doing 6-7 leagues per year. However, up until the DRAFT app came out I had never gotten into daily fantasy leagues. 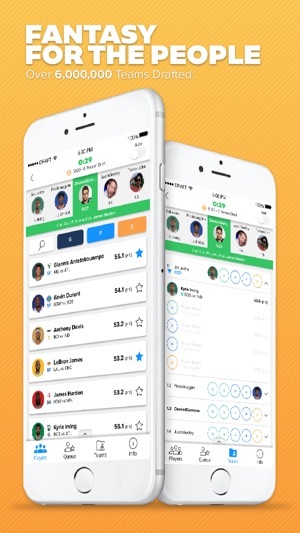 Fanduel and DraftKings have too much juice built into the competitions so it is nearly impossible to make money or even break even playing on those sites. The buy-in fees are too high, you can't play for small amounts like $1-3. And finally, the salary cap concept just isn't that fun to play. 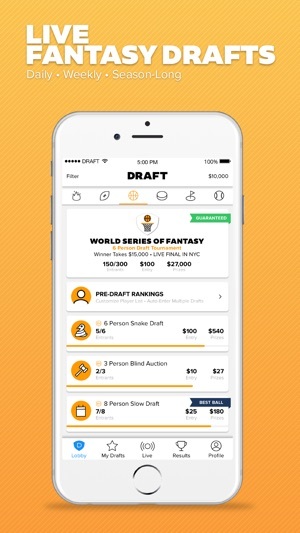 DRAFT offering a snake draft format, with inexpensive buy-ins (as little as $1), and offering fun, fast-paced drafts that start every few minutes, completely changes the complexion of daily fantasy. It is so much better playing this way! This has now become my favorite way to play fantasy football. Not to mention, the juice built into the leagues on DRAFT is only %10, very similar to the juice on casino or online sports betting. The beauty is that playing against the general public is actually much easier than playing against the sports books in Vegas that use all sorts of advanced mathematics to determine point spreads. 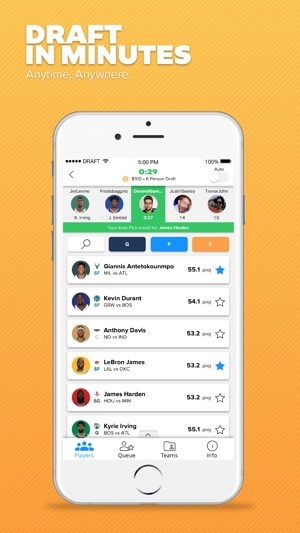 DRAFT gives you a better shot at making money or breaking even than any other daily fantasy product or traditional sports betting. Bottom line, this is a fantastic product! If you have not tried it yet, download it right now and give it a shot! Thank you so much! We are thrilled that you are enjoying DRAFT! I won a semi finals match up this week and was supposed to win 200$ and move on to the finals In a tournament of 512 I had the first pick and took Zeke and gurley mike Thomas Travis kelce drew brees and was winning by 70 points and the contest disappeared and I was told I have to re play the contest next week and best the person twice in order to win and move on ... I highly suggest you do not put your hard earned money into this am mature hour app and just bet with a bookie because when you finally win a big tournament they come up with some bull crap excuse and don't pay out. That's the first instance also this week I had drafted Zeke and the app said he was suspended so I swapped him out for lamar miller well once Zeke was pronounced active and eligible to play I was stuck with lamar miller . In all of the contests I lost this week they issued no refund and kept my money BUT the one contest I won they refused to pay me out and told me I have to win the contest all over again next week in order to get paid . Happy to try and get this resolved if you reach out to support@draft.com. 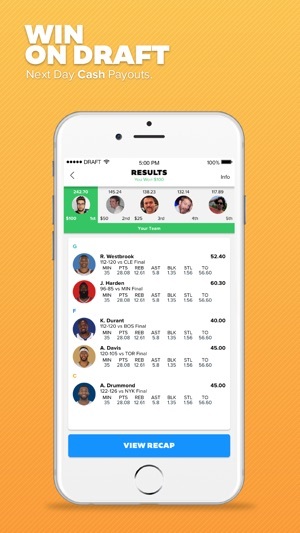 It sounds like you had a tough week with all of the crazy things going on in the NFL and with our app on Sunday. Would love to hear back from you.